Living in the cherry capital of Australia, Young NSW, means that come summer we are inundated with delicious cherries. In fact there are more cherries than I can eat! 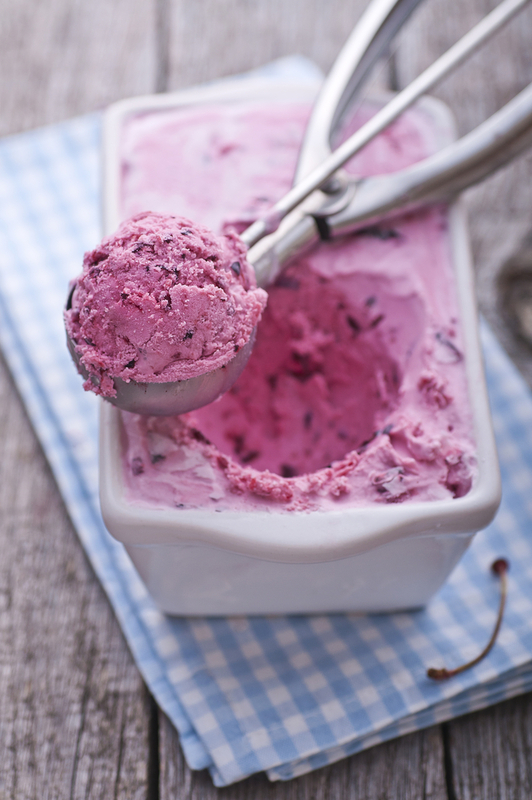 I use them in recipes, eat them plain and make pot, after pot of jam but this year I thought I would try something different and make a deliciously refreshing cherry and yoghurt ‘ice cream’. Combine the all ingredients in a bowl and gently fold until mixture is just combined. Pour into a shallow metal container. Cover with foil and place in the freezer for 4 hours or until almost set. Use a large metal spoon to roughly break up the ice-cream. Transfer mixture to a large bowl and use an electric beater to beat until smooth. Quickly return mixture to the metal container. Cover with foil and freeze for another 4 hours or until firm. Scoop into bowls and serve immediately. That is such a gorgeous photo. I just want to reach in and grab that ice cream scoop off the screen. Awe thank you Melissa – you’ll have to give it a try! Yes you’ll have to give this one a try then Al! I also love to slow cook pork in cherry sauce – delicous. Thank you for your kind words and I hope you enjoy my blog! Unfortunately I don’t yet Big Al – I’ll have to make one and pop it up for you! Did you make the Cherry Ice Cream?